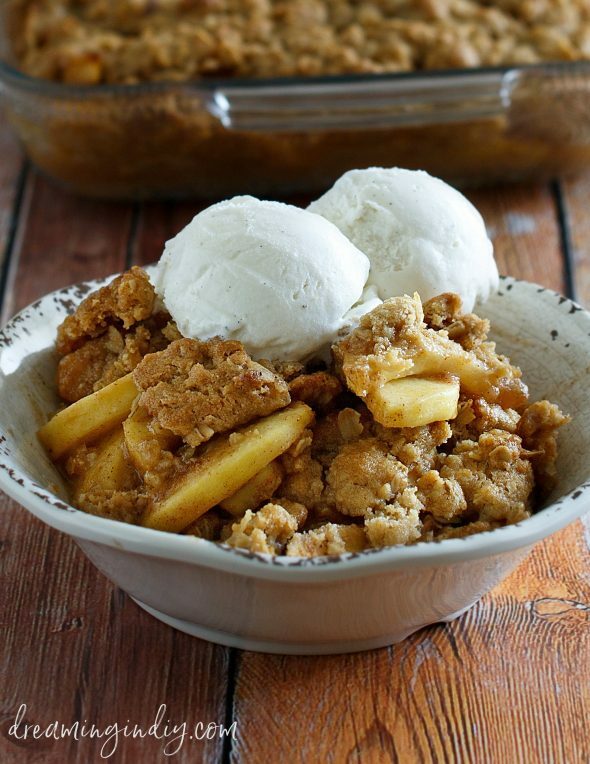 It’s not officially fall without apple crisp with vanilla ice cream for dessert! This family favorite recipe is SO easy and always a big hit with kids and adults alike. 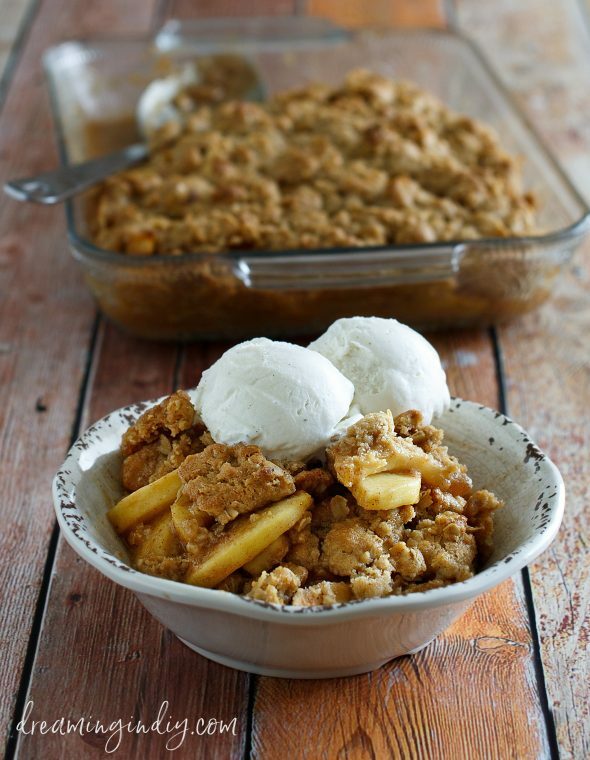 Growing up, I think our Dad made apple or peach crisp every single Monday night from September clear through February. It’s the perfect quick and easy family night and fall through winter dinner party dessert recipe. BONUS: the kids will have so much fun helping in the kitchen and will love making memories and baking it with their own kids someday! If you know how to operate an oven, have a couple mixing bowls, spoons, and a 9×13 baking dish, you can make this easy dessert. The simple ingredients are the perfect flavor combination and your home is going to smell SO yummy while it bakes! 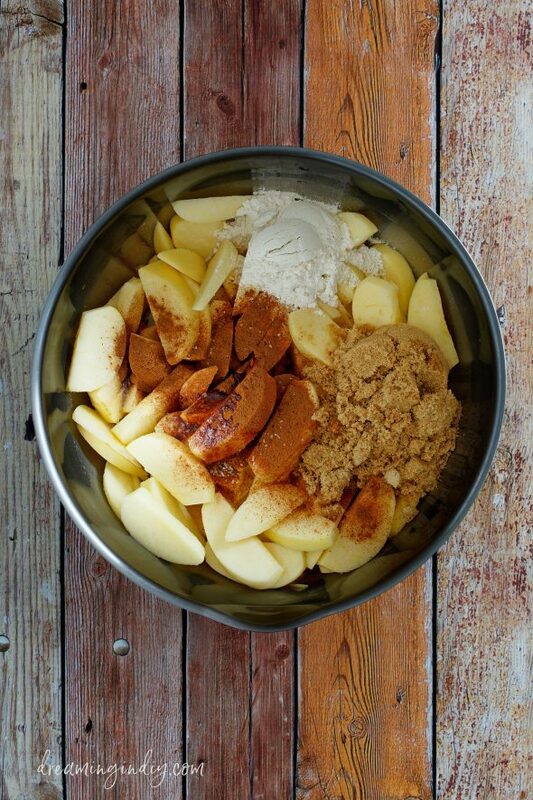 I mean, cinnamon and apples all caramelizing away in perfect harmony…c’mon. Before you get started creating this new family favorite – make sure to PIN THE IMAGE BELOW so you can find your way back to make it again and again and pass the recipe on to your friends, family and kids! The easy to follow, step-by-step complete recipe is at the end of this post – but here is the rundown so you can see how SUPER simple and quick it really is! Throw all of your crumb topping ingredients together in a large mixing bowl and mix it up with a fork until it forms small crumbs. Move it to the fridge while you make your apple filling. 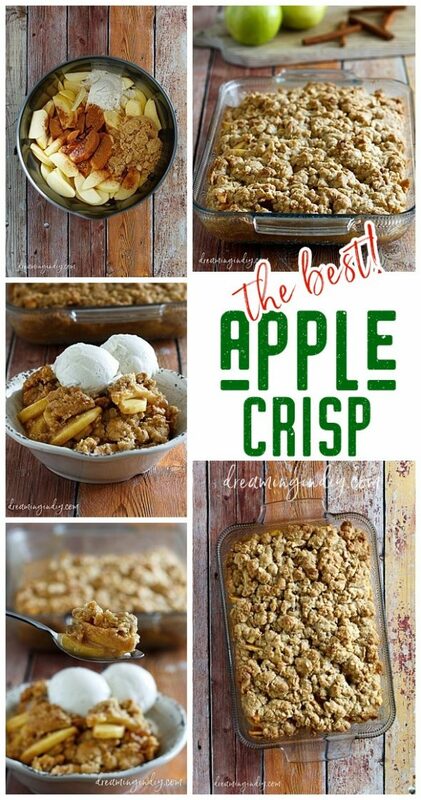 Mix together your apple filling in a separate bowl and dump it and spread it evenly in your 9×13 baking dish. Truschoome. You want one of these babies. 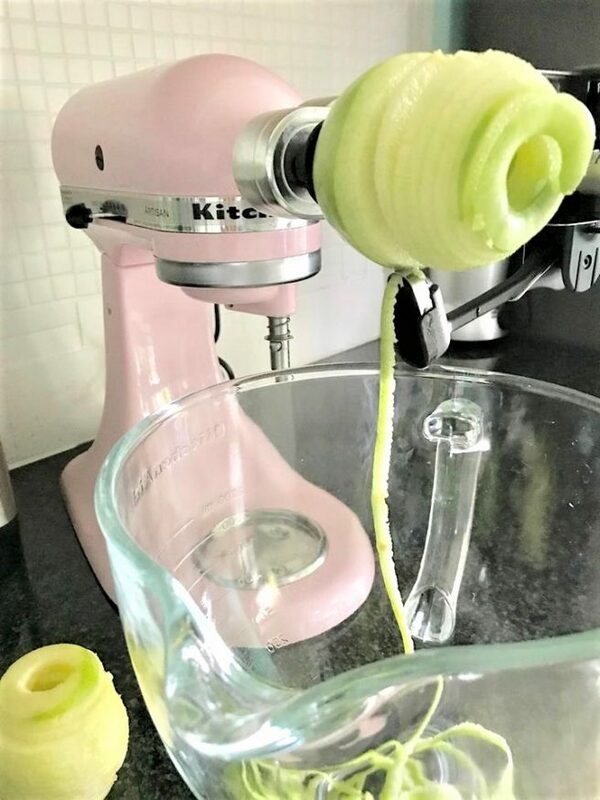 CLICK HERE to get your very own Spiralizer Attachment with Peel, Core & Slice for your KitchenAid stand mixer! 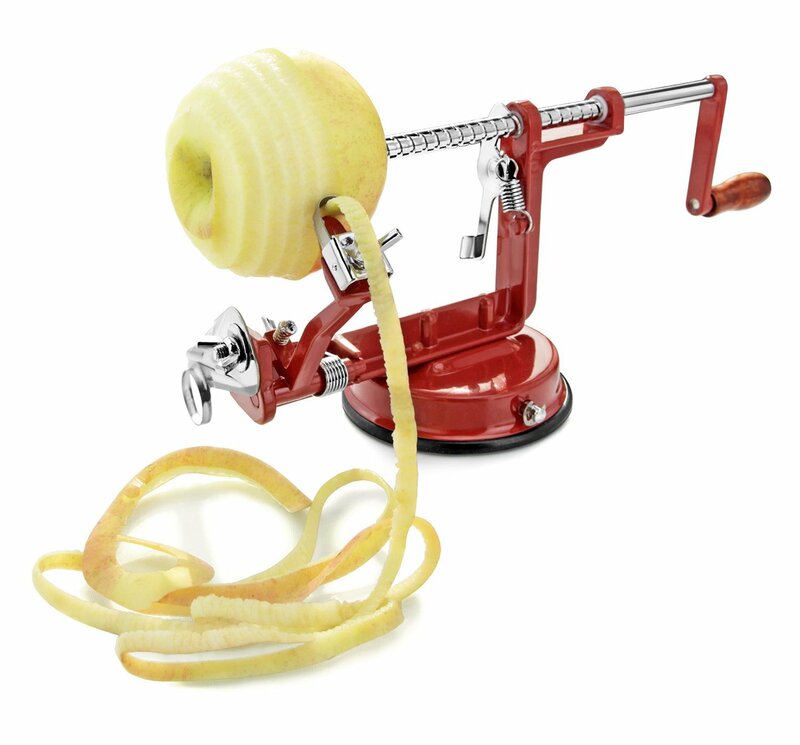 If you don’t have a KitchenAid Stand Mixer, pick up one of THESE apple and potato peeler slicer corers! 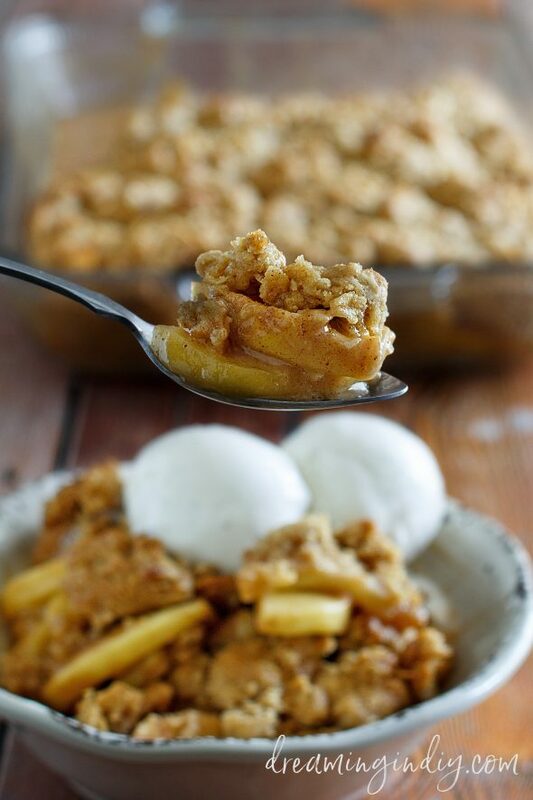 Sprinkle your refrigerated crumb topping mixture from the fridge evenly over the top of your apple filling mixture and bake! Can’t you just smell it through your screen? The hardest part is waiting the 10 minutes for it to cool off a bit so you don’t burn the bejeebers outta your mouth. Waiting is hard. So hard. You can serve it up plain – but our favorite way is to add a scoop or two of vanilla ice cream on top! Or three. Who’s counting. I think since there’s oats, cinnamon and apples in it, we should be able to get away with eating it for breakfast. Right? So right. Here’s the printer friendly version of this yummy recipe for your binder of favorites. Enjoy! Combine all of the crumb topping ingredients with a fork in a medium to large mixing bowl until it forms small crumbs. Refrigerate and move on to prepare the apple filling. 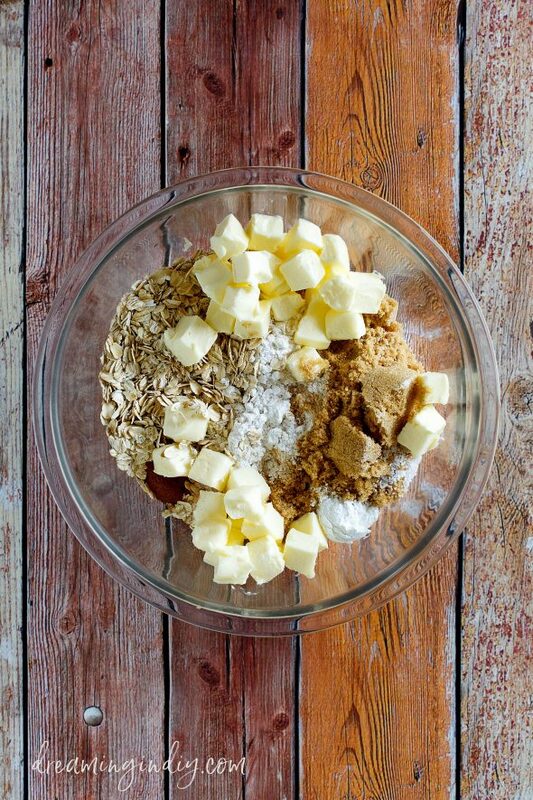 In a small bowl, combine melted butter and flour with a fork or wire whisk until well blended. Add lemon juice, milk and vanilla and stir well. Stir in brown sugar, cinnamon, and salt. Pour butter mixture over apples and toss to coat. 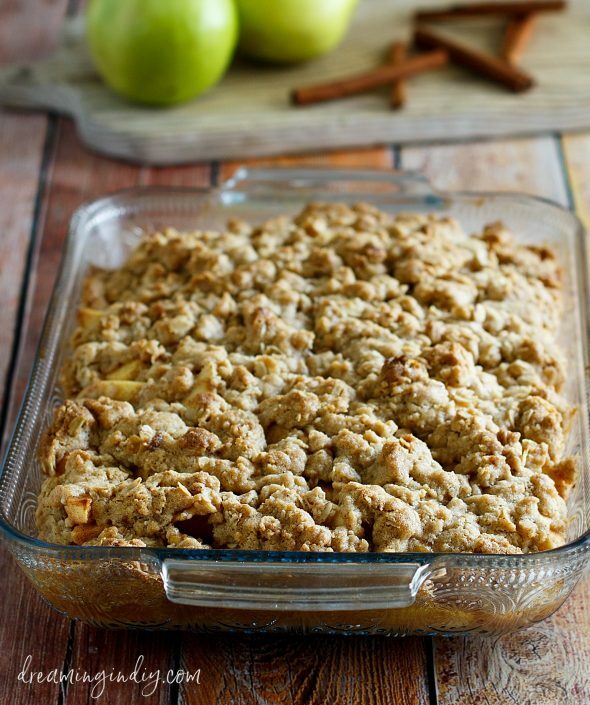 Pour apple mixture into a 9x13-inch baking dish and spread into an even layer. 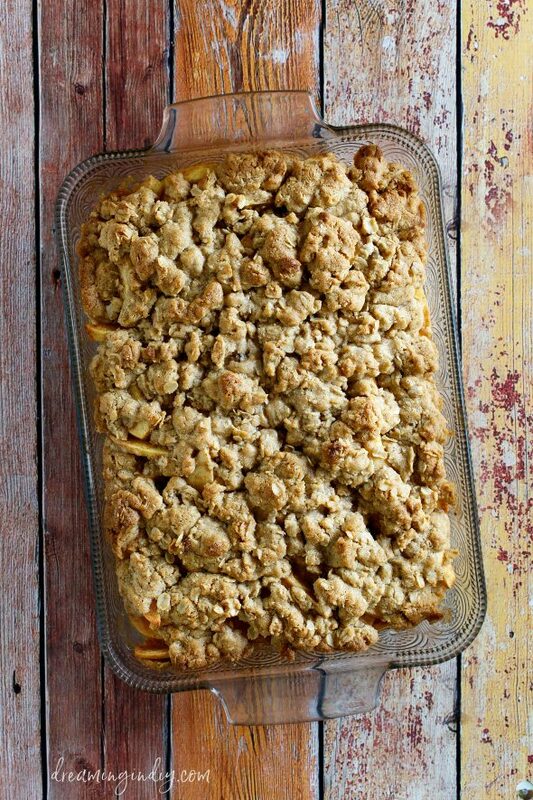 Sprinkle crumb topping evenly over the apples. Bake for 30-35 minutes or until golden brown and top is set. Remove from oven and allow to cool for 10 minutes before serving. Scoop up individual servings while it's nice and warm into bowls or plates and top each serving with a scoop or two (or three) of your favorite vanilla ice cream! Don’t forget to PIN THE IMAGE BELOW – your family is going to be requesting this yummy and easy dessert again and again all fall and winter long! It depends on how much you scoop out for each serving. It makes a full 9×13 baking dish. We usually get at least 9 servings out of it. Hope that helps! Hi Randee, I’ve never tried since it’s so easy and quick to make. All of the ingredients are freezer friendly, so I don’t know why it wouldn’t be just fine after freezing it! can you use already canned apple pie filling? If so, how many quarts would you suggest using for this recipe? I don’t see why not, Tally. I’d guess at least 2 quarts or 2 large cans. Spread it out evenly in the bottom of your 9×13 baking dish and it should be about an inch or an inch and a half deep. Add another quart if it needs it until you get it how deep you like and then make and add the topping per the recipe and follow the rest of the instructions. I bet it turns out great! awesome thanks so much! I can’t wait to try it.